From the creators of World Reaction comes a new addicting game that challenges your accuracy, speed, and memory. Memory Bounce is a simple yet highly addictive game that challenges your speed and memory as you race against the clock. 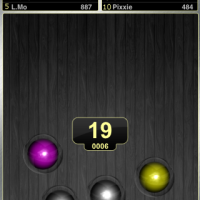 The goal of the game is to match the colors of the falling orbs by tapping on them to reveal their color. Once you match two, they disappear and you are awarded points. One of the great features of Memory Bounce is being able to play against the world in real time. 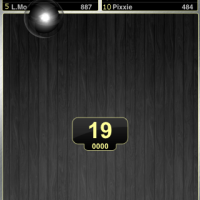 As you play and gain a score, you have the chance to get into the Top 10 which is visible in real time as you are playing. The scores update in real time and that tracking allows you to see exactly where you stand against other players of the game. As you begin to play, you are racing against the clock. 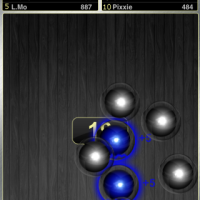 Each orb that is on the screen has a hidden color that can only be revealed once you tap that orb. Matching two orbs of the same color gains you points, as each color has a unique value but you can only tap two orbs are a time to see what color they are. This is where the memory challenge of the game comes in. To get the highest score before the time runs out, you have to remember which orbs were a specific color so you can quickly tap that orb again to gain points. 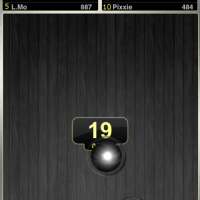 To add to the challenge, the orbs are constantly moving and bouncing. 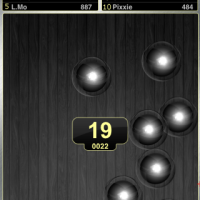 If you are accurate enough, sum the orb points to the total points in the middle of the playing area (yellow score in the center of the images) which will gain you more points and time bonuses. But, the only way to get that middle score is to memorize what color gives you what point value! Memory Bounce includes an unlimited number of levels with the ultimate goal of getting your name in the top 10 leader board and unlocking various achievements through the use of OpenFeint. 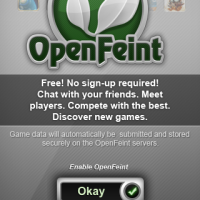 OpenFeint is an in-game function that lets you use global chat and gives you the ability to challenge friends on a friends list. 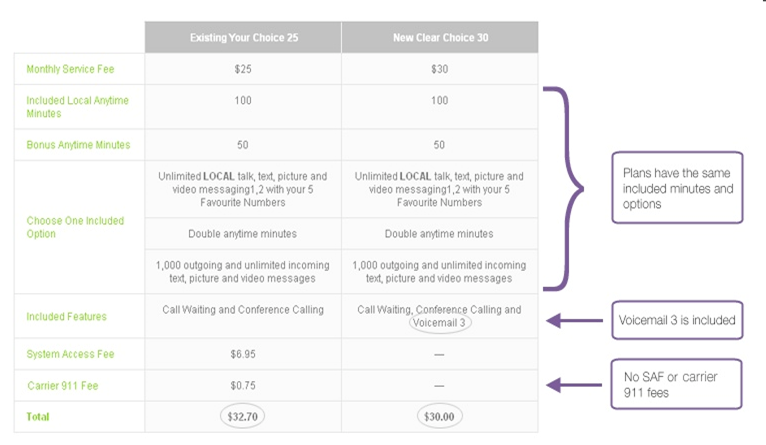 OpenFeint also includes Facebook and Twitter integration. The only concern is the replayability value. If achievements and leaderboard goals are not something you care for, which is all the game really offers in terms of incentives, the game will not have a very high replayability value for you. The game has no menu navigation at all and moves everything to the opening splash screen. From this screen you can toggle sound effects and music but once you are in the game, you are stuck with those settings until you end your session. As mentioned previously, you have to match two orbs of the same color to get points. Revealing the orb colors is done by tapping once on any orb. Tapping on the orb again turns its color off. If you have too many orbs on the screen, you can double-tap on any orb and that orb will be destroyed but you do lose points for this. Memory Bounce also makes use of the iPhone accelerometer so you can move the orbs all over the playing area by simply rotating the device. During game-play, Memory Bounce has soft puzzle-type music playing in the background with various sound effects for when you match two orbs of the same color. You can toggle the sounds on or off from the opening splash screen but not during game-play. Memory Bounce also lets you use your iPod music during game-play, so if the game’s stock music doesn’t do it for you, you can always fall back on some of your own epic music stored on your device. The visuals are great for a puzzle game and it reminds me a lot of Bejeweled, with less orb glow. 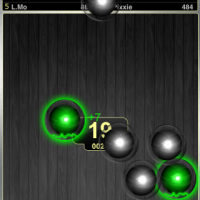 For iPhone 3GS and iPod Touch 3rd gen users, the game runs smooth but for iPhone 3G and iPod Touch previous generation owners, you may see small lags when the animation plays when you match two orbs of the same color, so keep that in mind. Memory Bounce is scored a 4 out of 5. 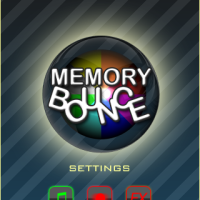 Memory Bounce is available on the iTunes App Store for $0.99. 1.) What is the name of a childhood game that you played that challenged your speed and memory? Winners are chosen at random; Contest ends October 28, 2009 at 11:59PM PST. 1.) Make sure toÂ include your email in the name entry form or I cannot contact you! 2.) You may enter even if you have won something before. You can win again and again and again! There is no limit on the amount of times that you can win! 3.) OneÂ Contest Entry Per Person. DoÂ NOT attempt to post multipleÂ contest entries under different emails and/or user names during the same contest. 4.) Winner(s) must claim prize(s)Â within 24 hours of me sending the confirmation email. Failure to do so results in expulsion from the contest.